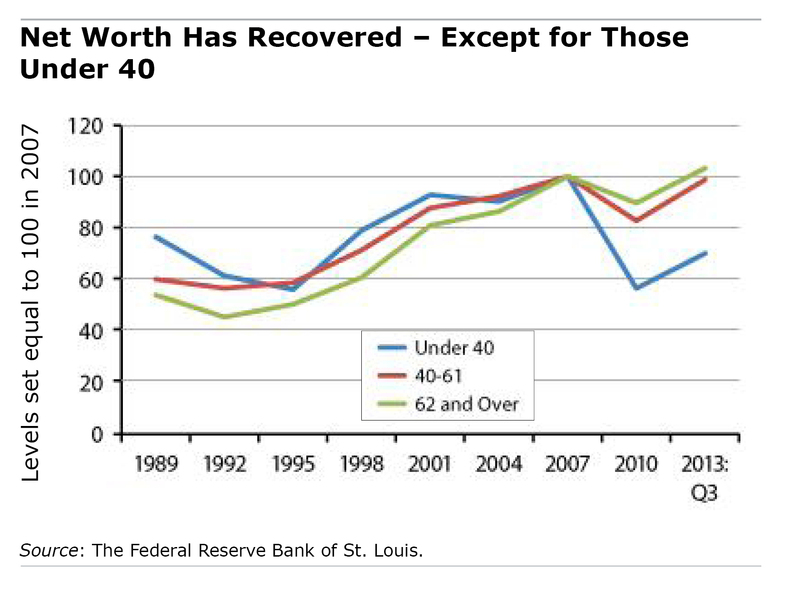 The Federal Reserve Bank of St. Louis, based on its analysis of data from the Survey of Consumer Finances, estimates that the recession has ended for only about one-quarter of the U.S. population – the thrivers, who have paid down their debts and restored their savings. That would leave three out of four Americans who are still struggling. Squared Away interviewed Ray Boshara, director of the Center for Household Financial Stability at the bank; Bill Emmons, senior economic adviser; and Bryan Noeth, policy analyst, for their insights into why most Americans’ net worth – their assets minus debts – hasn’t recovered. Q: You distinguish “thrivers” from “strugglers.” Who are these two groups? Boshara: The thrivers versus strugglers construct is a simple way to make the point that some demographically defined groups are doing better, on average, than others in terms of net worth – what you save, own, and owe, or your entire balance sheet. We found that age, race, ethnicity and education levels are pretty strong predictors of who lost wealth and who’s recovered wealth over the past few years, as well as over a longer period of time. Q: Describe the typical thrivers. Emmons: Whites and Asians with a college degree who are over 40 – that’s the typical thriver. Remember, this is a construct, and it’s not 100 percent foolproof. But you would tend to say these groups are more likely to have outcomes consistent with recovering. Q: How about the typical strugglers? Emmons: By age – they’re younger – and they’re African-American or Latino. They also do not have a college degree, and they have too much debt. They’re the other three-fourths of the population. They are not holding enough liquid assets, so they’re just one paycheck away from a crisis. They do not have a diversified portfolio and aren’t benefitting from the stock market gains. They’ve got too much in the house, which has declined in value. Q: What have you learned about young adults and their wealth – or lack of it? Emmons: It jumps off the page in our analysis: It doesn’t matter if you’re white or college educated. If you’re young, you’re vulnerable, and you’ve made the same portfolio mistakes as people with less education: low levels of liquid assets, too much in the house, an issue that is related to portfolio diversification, and more leverage. Boshara: And this effect on young people is beyond the fact they haven’t had a full lifetime to build wealth – that’s the life-cycle effect so you expect that. But Bill and Bryan have found that, holding constant the determinants of family wealth, including where you are in the life cycle, those born in the latter part of the 20th century are less wealthy than their parents were at a similar age. So, even when their wealth peaks, they’re probably going to peak at a potentially lower level than their parents or grandparents did. Q: Why focus on wealth, rather than income? There are things about the balance sheet that contribute to your financial stability, upward mobility, and intergenerational mobility that you don’t get by looking at income. When you own things, you can do things in life that you couldn’t do if you had only income. Pass on property to the next generation. Make investments in the future. Have something to fall back on if you lose a job. Pay medical bills or finance college in ways that you can’t if you don’t have income. Q: Does the balance sheet matter more in the wake of the Great Recession? Boshara: It’s always mattered. But when you’re talking about lower-income families, it’s something we’ve ignored or didn’t pay very much attention to. The attitude was that poor people can’t save or build wealth so why bother. But I also think it does matter more now, because over $16 trillion of wealth was lost in the financial crisis and the recession. Those with weak balance sheets haven’t recovered, and those with stock market wealth have. It explains the recovery in ways that people who are only looking at, say, the job numbers, don’t. If we adjust for inflation and population growth, we’ve more than recovered that $16 trillion. But if you break down what accounts for that wealth, about 86 percent of that recovered wealth comes from appreciation in the stock market and only 12 percent comes from the housing market. This is highly uneven. We also crunched the numbers and found that about 10 percent of the population has over 80 percent of the stock ownership in the country. Since the vast majority of people have their assets in housing, you can see why this doesn’t feel like a strong recovery at all. This is why we come back to, you’ve got to be diversified, even if you’re lower income. First, build up emergency savings to achieve some level of financial stability. Save in a 529 college plan or 401(k) to get some exposure to the growing parts of the economy. Finally, avoid excessive debt. Too much debt is the necessary and sufficient condition for household financial instability. This is a key insight of the balance-sheet perspective: How you finance your assets is just as important as what assets you own. The bleak balance sheet of those under 40, blacks and Latinos are linked to their higher unemployment and lower wages. And it may well get worse. (See Harold Myerson’s op-ed column in today’s Washington Post.) Few of them are in, or going to be in, a position to take the good financial advice presented at the end of the interview. Unfortunately, this study cannot have recourse to the financial position of the same group before the recession struck (or so I gather). 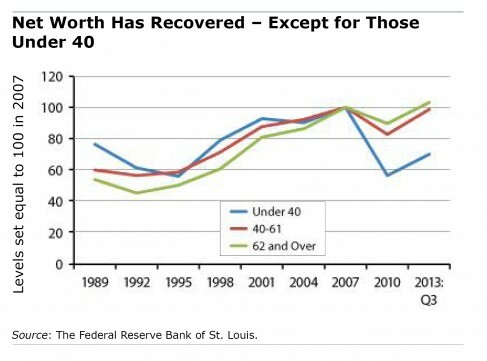 “… the recession has ended for only about one-quarter of the U.S. population – the thrivers, who have paid down their debts and restored their savings…Whites and Asians with a college degree who are over 40 – that’s the typical thriver.” This suggests that people who were already well to do before the crisis struck AND were already in a “tenured” position, i.e. in a situation where their career was quite stable, have little problem thriving. But if you were already in a hole in 2007/2008 even if you just started climbing its walls, it didn’t help when the rug was pulled from under you.